LATE SUNDAY MORNING we turned off the Laura Ingalls Wilder Historic Highway in Springfield, pulled by the prairie winds. 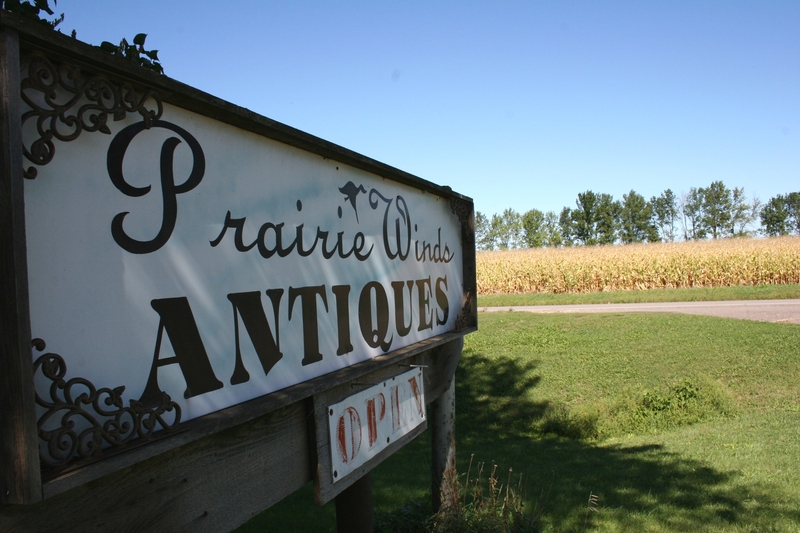 That would be Prairie Winds Antiques, an appropriate name for a business on the edge of this farming community on the wind-swept prairie of southwestern Minnesota. My sister Lanae had stopped there the day before and picked up an antique—shelves or a box or something—I never saw it. “There’s an antique store in Springfield?” I asked, even exclaimed when she raved about the place. And that was enough to draw me to Prairie Winds Antiques. So, Sunday, as my husband, son and I were returning to Faribault from a weekend in rural Redwood County, the guys indulged me (sort of) and we pulled off U.S. Highway 14. I must clarify that this stop did not come without protest from the teenager in the back seat who was reading a book and was overtired from a night of star-gazing under the inky black expanse of prairie sky. But we stopped anyway, and lucky for him, but unlucky for me, Prairie Winds Antiques was closed, despite the OPEN sign. Despite the OPEN signage, Prairie Winds Antiques was locked late Sunday morning. That didn’t stop me from poking around the exterior of the shop, where a cluttered yard full of antiques and collectibles sat exposed to the elements. Pails, tables, signs, farm machinery, garden art, soda bottles, wash tubs, bicycles, sleds, an old car…lots to peruse in the presence of an impatient son. 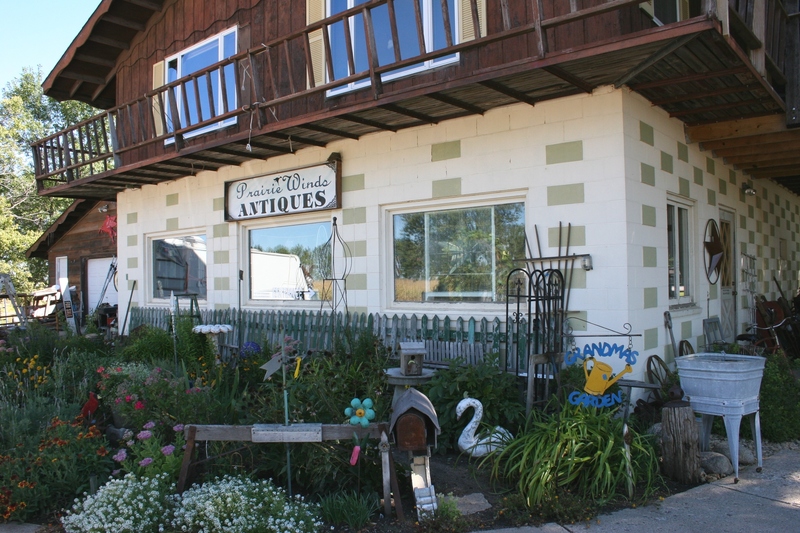 Even outdoors, you'll find lots of antiques and collectibles at Prairie Winds Antiques. So I hurried as quickly as I can hurry around old stuff, snapping a few photos and wondering if the pile of stuff that looked like it was in a pile of junk to be burned was really a pile to be burned. 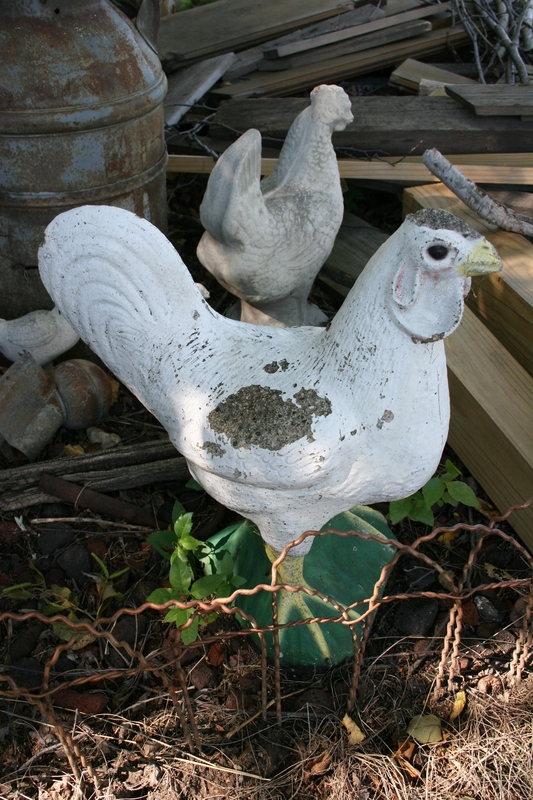 I was tempted to take the painted wooden bird with the spindly wire legs from the burning pile because it reminded me of the kitschy painted wooden yard art my grandpa staked in his front yard. You can bet that the next time we’re driving U.S. Highway 14—the road west so many years ago for those brave, adventuresome pioneers—that we’ll pull into Prairie Winds Antiques again. I need to get inside that place. Oh, yeah. 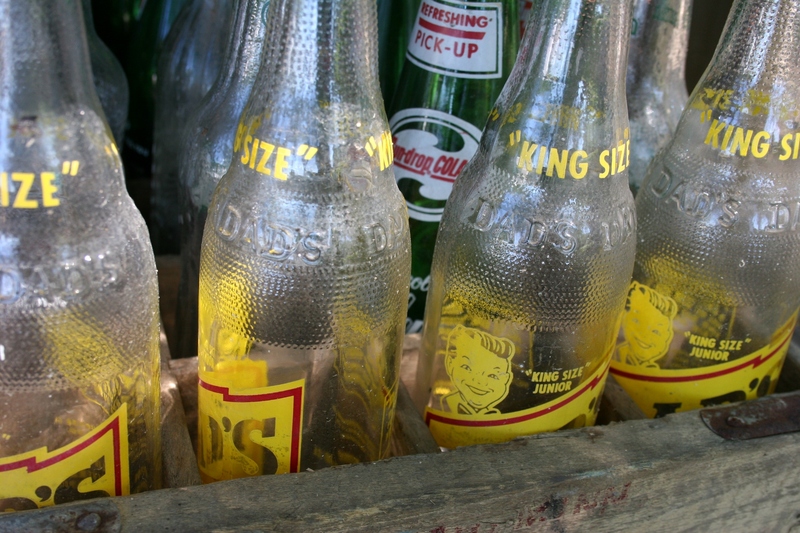 The wooden crates crammed with old soda bottles remind me of the days of my youth when pop was a treat reserved for special family celebrations like birthdays. 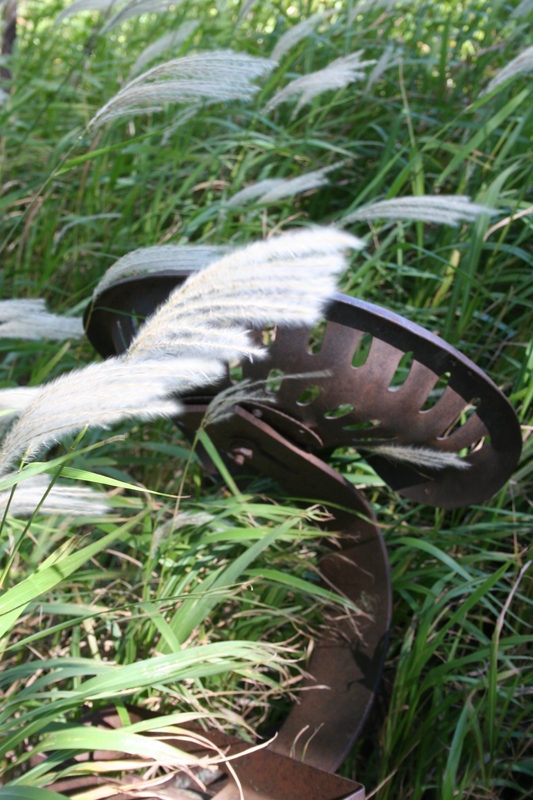 On-site prairie grasses dip and sway in the wind around old farm equipment at Prairie Winds Antiques on the west edge of Springfield. 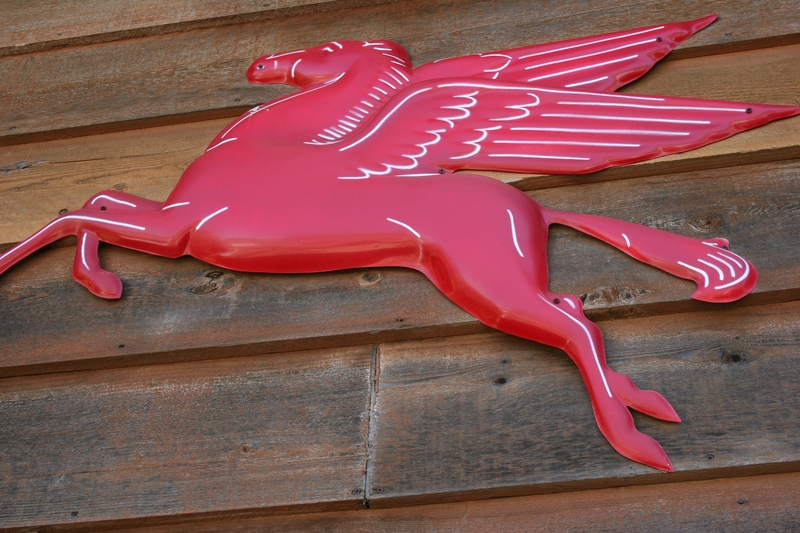 This Flying Red Horse is attached to the garage at the antique shop. I've always had an affinity for this gas station symbol. As a youngster, when our family traveled once a year to visit relatives in Minneapolis, our dad always told us to "Watch for the Flying Red Horse." I don't recall why or where that horse was located; it may have been a landmark to direct us to the right road. I wish I could remember. I spotted this grasshopper clinging to the edge of a long, weathered table sitting in the yard at the antique store. I immediately thought of the grasshoppers that, in the days of Laura Ingalls Wilder, infested this land and destroyed crops. 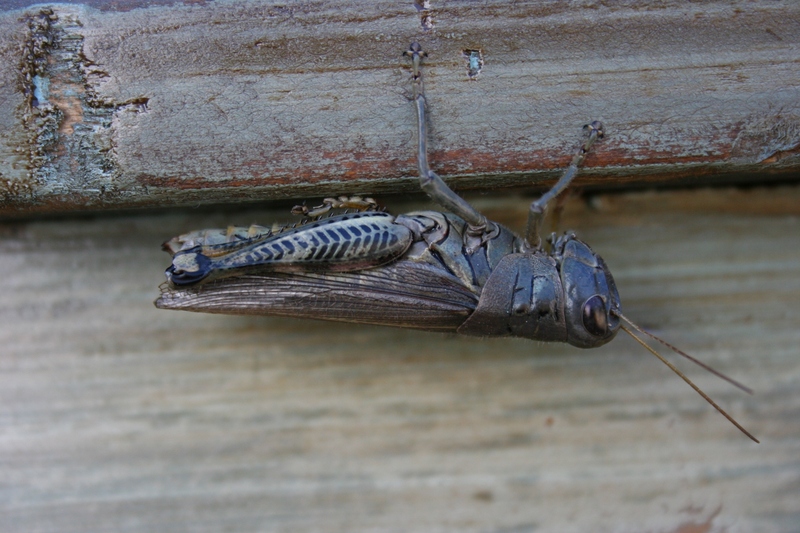 Wilder wrote about the grasshoppers in her "Little House" books. I do not like real chickens, not one bit. But these two free-range fake birds charmed me. I cannot even believe I just wrote that.